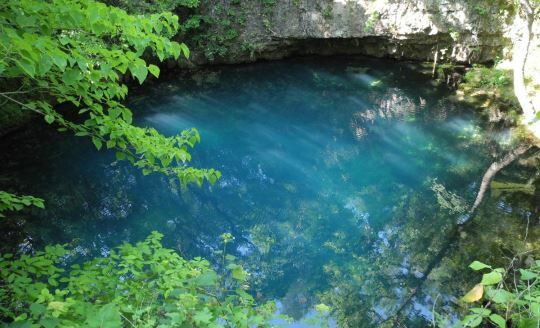 Located approximately 13 miles north of Eminence on Highway 19 is Round Spring. The spring flows into an almost perfectly circular cavern that has collapsed, and from there it travels through a natural tunnel before it emerges into the spring branch. It is believed that a portion of the spring’s recharge area is to the northeast of Spring Valley, which means that the water would have to flow under the Current River to reach the spring. Round Spring was also one of the first parks in the Missouri state park system (1932). The Round Spring State Park was incorporated into the Ozark National Scenic Riverways in 1972.